Similar to other transformative technologies, electric vehicles are creating a wide range of effective economic development challenges and opportunities. While the global electric market is still at a nascent stage of development, it is poised to reform industries and communities across the globe. In 2016, global stock of electric vehicles reached 2 million units after crossing the threshold of 1 million units in 2015. This rapid growth is majorly driven by the China, Japan and several European countries. The adoption of electric vehicles is majorly motivated by several factors, including strong technological progress in battery technology, cost reductions, purchase incentives, and government policy supports and advanced charging infrastructure availability. One of the biggest factors driving the growth electric vehicle sales is the presence of monetary and non-monetary government subsidies. For instance, Norwegian government is driving the electric vehicles market attractiveness with the measures like access to bus lanes or free parking across the country. Chinese government is also providing support for electric scooter market development by banning conventional scooters from mega cities in order to reduce emissions. In 2013, this initiative led to the sales of 9.4 million electric scooter sales. Such government initiative by governments in different geographic regions is expected to spur the demand for electric vehicles across the globe. Many developed and developing economies are accelerating the deployment of electric vehicles until 2020 and during the 2020-2030, as it will be essential for reaching global electric vehicles deployment rates along with clean mobility and decarbonisation imperatives. In recent years countries involved in EVI (Electric Vehicle Initiative), have set their targets for the deployment of electric cars as a part of their clean energy and mobility ambitions. Majorly 14 countries had electric vehicles targets for deployment by 2020: Austria, Germany, India, Japan, Netherlands, China and United States among others. 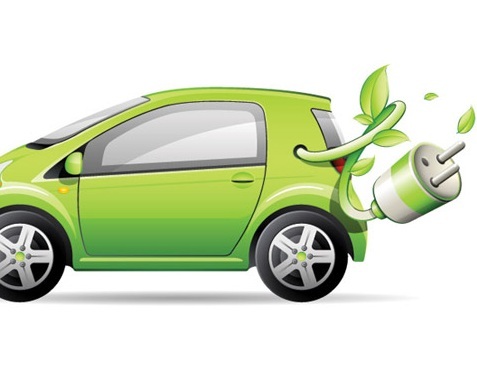 Such initiatives by different governments are likely to propel the growth of electric vehicles market in nearby future. In 2016, apart from regional governments major automotive OEMs also announced the electric vehicle deployment targets. These OEMs included Tesla which is aiming to deploy around 1 million electric cars by 2020 and Volkswagen also unveiled the plans for a significant shift towards the production electric vehicles and announced to enter around 30 electric models in the market by 2025. Moreover, deployment of electric two wheelers and commercial vehicles has also gain traction in past few years in order to curb emissions from commercial and two wheeler vehicles. The global electric bus stock grew to about 345 000 in 2016 with China emerging as a leader in the electrification of buses. Financial incentives by different governments for individuals, businesses and local authorities are also aiding the market growth of electric vehicles across the globe. For instance, in China the government is supporting municipalities in deploying charging infrastructure by providing subsidies in construction of charging stations. However, lack of awareness among people of developing countries and lack of government initiatives to provide better policies and infrastructure for the adoption of electric vehicles hinders the global electric passenger vehicles market. Additionally, despite decreasing costs of batteries electric vehicles battery packs are the major component which accounts for the more than 25% of electric vehicle price which is expected to hinder the growth of electric vehicles market growth. 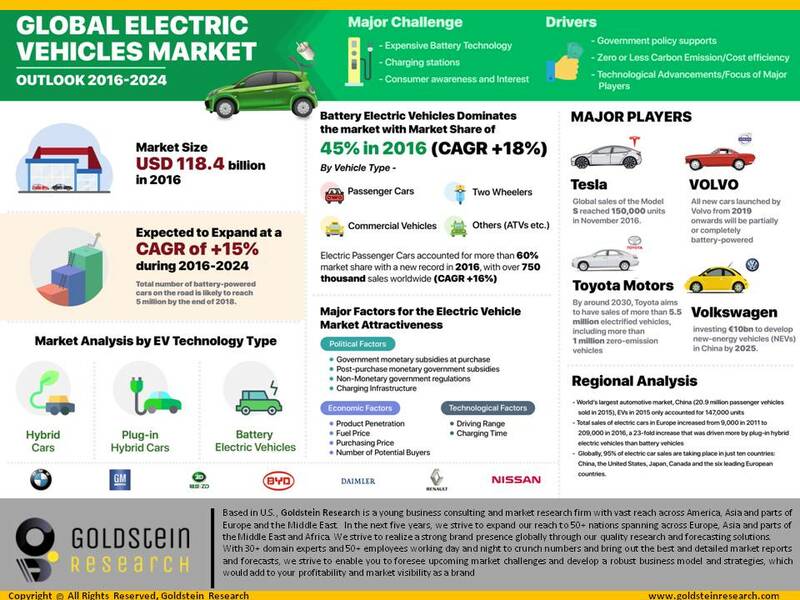 The global electric vehicles market accounted for USD 118.4 billion in 2016 and is expected to reach USD 346.3 billion by the end of forecast period i.e. 2024. Further the market is anticipated to expand at a compound annual growth rate of 14.3% over the forecast period i.e. 2016-2024. Geographically, Asia Pacific region accounted for the highest revenue share of more than 35% of global electric vehicle market in 2016. China is the largest market in Asia Pacific region accounting for nearly half of 2016 sales of electric vehicles across the globe. China is closely followed by the Europe with more than 28% market share in which revenue share was over 20% in Norway, nearly 10% in the Netherlands. North America has witnessed declined in sales of electric vehicles and the market has recovered in 2016 and has grown at CAGR of more than 30% over the past four years. The sale of electric vehicles in North America is up by 38% in 2016 after being down 6% in 2015. The North America market is likely to recover in coming years and expected to surpass Europe over the forecast period.